"The month of January 1967 saw the completion of a full month's distribution of "combat liquor rations" to aircrew members after each combat mission. This ration is dispensed at the centralized maintenance and intelligence debriefing following the completion of the mission flown. The liquor ration was obtained in coordination with the Flight Surgeon's Office. The squadron Intelligence Section controls the dispensing of the combat ration and also maintains the necessary records for control and requisition purposes." We put this on the website and asked "Who Knew?" and received about a dozen responses via email from frontenders and backenders alike. This article updates those entries to a standard format, and includes a Comments feature that now allows viewers to add their recollections directly from this webpage. Thanks for taking a look at this topic and we encourage a continuing conversation by filling in your own personal remarks in the Comments section below. I was TDY to Phu Cat for 30 daze and they had post-mission beer. Must've been at the Det 1 de-brief, but don't recall fer sure. No such thing (combat liquor ration) at TSN during my tenure. Yes, I remember the distro of hard liquor after a mission. Believe we were limited to one or two of the small bottles. Same size as syrup bottles served with ur pancakes at Cracker Barrel. Tom, the Bamboo Hut on DaNang near Helicopter Village did sell limited supplies of booze but most of the guys went to our hootch bar ran by the squadron. Actually, "Charlie" threw in some rockets that put an end to the Bamboo Hut not long before we left there for Ubon, Thailand. But we never were issued booze in post mission briefings. Tom, I was in Nha Trang at that time and never heard any of the 361st guys talking about this. If it existed, they kept their secrets better than our guys. Tom, I arrived Tan Son Nhut in April '68 - never heard anyone talk about "combat liquor rations". Tom, at DaNang (with Mike Murray), we were asked by the 1st Sgt to donate a bottle of booze from our monthly rations (we were issued a ration card for booze and cigarettes) to the squadron bar. Bulk beer purchased was done with a letter from the Commander (from Saigon) which was normally bought by the pallet. Individuals could purchase single cases at the beer sales with cost of a case running $3 for premium beer, and crap beer (Black Label) for .50 cents. With the beer only laying out in the sun surely didn’t help the taste of the beer over a period of time. The VC (as Mike referenced) helped us out with the Black Label. Even at .50 cents a case the beer wasn’t being sold and one morning the VC did us a favor by sending a 122MM rocket right smack into the middle of the beer sales area destroying the majority of the beer and all of the Black Label. Tom, I was at Nha Trang, 361st TEWS, from Mar ’67 to post-TET, Feb ’68. I was never much of a drinker in my early USAF days (nor even now) of either beer or the hard stuff, so maybe I just never noticed. But I don’t recall ever being introduced in Nam to liquor rations cards, or free alcohol (except as an individual offering from others at a party or get-together). This may have been a unique program existing only at certain organizations as their individual unique “support for the combat troops”. Tom, I was at Nha Trang ’68-69 and have to agree with Ed. If there was a ration, we never heard of it. On the liquor question, I have no memory of any such thing. Absolutely! I flew Drill Press out of Phu Bai and Pleiku (‘67/’68). At Phu Bai, the co-pilot handed it out at the end of each mission. It was miniatures of VSQ Brandy! Didn’t taste the best but we’d mix it with cool-aid and it wasn’t too bad. The co-pilot had it in his flight bag during the mission and passed it out on the crew-truck on our way to the mess hall. Aw, the good ol’ days!! Best year of my life – seriously!! I saw the combat liquor rations bit. It's news to me beings I was in maintenance ... but I will ask some front enders about it. Ed added: I’ve contacted two pilots, one was at Pleiku and DaNang, the other at DaNang, and they both said “not while they were there” on the liquor rations question. Tom you know those 1 and 1/2 ounce miniatures sold in liquor stores...after a mission at TSN we could get one after a mission. I took a few when I first started flying but soon stopped. I think they were Rye and I was a Scotch drinker. I assumed they were available at other bases. I was in Vietnam from Aug 67 to Aug 68. Spent my first six months at Hue Phu Bai until the TET offensive in Jan 68. They then relocated us to Pleiku. At Hue, the only beer available for a period of time was Olympia. The beer wasn't all that bad but the cans were not aluminum and they rusted around the rim. As far as combat liquor rations, I somehow missed out on it...and I flew on more than 200 missions. I was at Pleiku from ’68 to ’69. 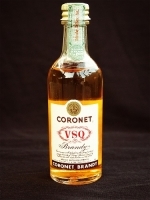 I not only received the small bottles of Coronet VSQ (what we called Mission Brandy), but I brought one home with me that I received in 1968. (See attached front and back picture). I thought no one would ever believe me so I’ve had it all of these years. Note the Federal Stock Number on the back label and the two years printed on the back bottle seal. 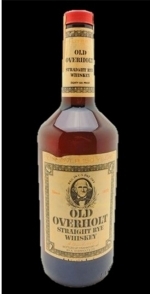 Admin note: The photos of the VSQ Brandy bottles at the top of this article were provided by Bill Helms. I was the first navigator in the 360th TEWS (April 1966) and remember debriefing with a Flight Surgeon who poured a small paper cup of Old Overholt rye whiskey. The whiskey would leak through the cup so you had to consume it quickly. This was still going on when I left Vietnam in June 1967. I have fond memories of setting up the squadron…. When we arrived we were given a patch of ground and told to build our squadron and start flying…so we did. I have damaged a few brain cells since Pleiku ('69-'70) but I recall that we would take our flight records to the dispensary and they gave us the sample bottles for the number of missions we flew for the month. However, I do not remember receiving any rations when I returned to Danang in '71. I do remember that we would stop at Phu Bai and drop off our calassified to the Army. On one stop we had to wait for them to show and I asked the AC if I could go to the terminal and use the restroom as we were still under the "you mess it, you clean it" rules and all the bags were gone. I went in and done my thing and on the way out I discovered they had a bar in the terminal. I purchased some 33 beers and we drank them on the way back to Danang. I can't remember what I used to buy them but we always carried some American money just in case we needed it. If anyone remembers the rations or our stop at the Phu Bai terminal please let me know. I was a pilot in the 362TEWS at Pleiku Oct ’67- ’68. We received rot gut “mission brandy” in miniature bottles after each mission (one bottle for each crew member). It was barely drinkable, so it was lined up on the walls of everyone’s hooch. Then some bright entrepreneur discovered that the cooks at the chow hall had no booze at all, and were willing to trade steaks for mission brandy! Trading was the essence of good life at Pleiku and we traded. I had a pet monkey for which I traded a skid of linoleum tile and five gallons of tile cement. Unfortunately, our Operations Officer discovered I was taking him on FCF’s and --well, there were repercussions. I was a 203 at TSN 69-70. Also flew out of Pleiku and NKP at times. 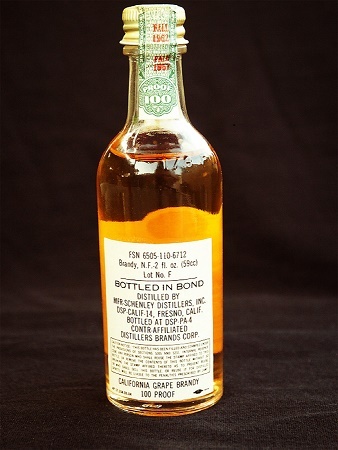 I remember getting some of the small bottles of rye - referred to as "mission brandy". The were offer to us in cardboard boxes in the 94th Ops room after a mission debrief. They were not there frequently. I was a 292 at Pleiku Aug '68 to Aug '69 and I remember 1 small bottle after each mission. It was really bad booze. "Dot" Dorsey and Rodney Gott were my good friends that were lost. I flew 126 missions and was grounded for 1 month with a broken wrist. We flew 1 day on, 1 day off, and 1 day standby. I remember flying a mission the day they landed on the moon. Flew 137 Missions out of Pleiku from Jan 1968 to Jan 1969 and I never saw or heard of anyone getting "mission booze". During that time frame if there was booze to be handed out I would have found it. I was in Nha Trang 68 -69 and remember liquor and beer monthly ration cards. I think we were allowed 3 bottles of hard liquor and 2 or 3 cases of beer. We also had a small bar located in our compound where we could purchase drinks. I was never offered anything after a mission. I flew as an amt out of Phu bai and the ac passed out the liquor as we deplaned . I was stationed at Nha Thrang from '68 to '69 and we did have the booze. Small bottles that tasted like rot gut. Terrible stuff. You had to stop by the Orderly Room after your flight and ask for it and the clerk or First Sergeant would hand you a small bottle or two. The key here is you HAD TO ASK FOR IT. They had cases of it behind the desk. I was at Nha Trang Nov. '68 until we moved to Phu Cat. Coronet brandy is very bad. It would cause one to quit dranking. I brought 6 home. My son and friends in high school stole them.